Many in media were shocked to see the last remains of former Tamil Nadu Chief Minister J Jayalalitha being buried and not cremated as per the Hindu customs. Actually, the hype of media reached its crescendo and they were well prepared for a grand brahmanical ceremony, but unfortunately their wish could not be fulfilled. Those who know the legacy of Periyar and Dravidian movement will understand that all of them followed a legacy defined and articulated by Periyar. Jayalalitha was a non-Tamil and brahmin, yet part of the AIADMK through its thick and thin. Even when it was well known that she diluted the whole Dravidian ideological legacies, the concept of welfare measures are part of this historical legacy and that is why Tamil Nadu remain one of the best Indian states in terms of welfare measures of the people. The whole concept of Mid Day meal in India actually came through MGR's successful programme in Tamil Nadu. Even today, the meals provided in Tamilnadu remain better than other states. Many a time, the media convert the entire issue of Tamil Nadu politics as influenced by the film stars without understanding the whole legacy of the Dravidian movement. People might not even remember Jayalalitha as a film star but the legacy of Dravidian movement was with her even as I said, she diluted it and compromised with the brahmanical forces many times but then politics is the art of managing contradictions. Jayalalitha reduced her ministers to nothing. Paneer Selvam was a pale shadow of her. Most of the ministers would just stand in front of her. But then it is politics which worship the power. Jayalalitha was humiliated when MGR passed away and was merely an óutsider'even when every one knew that she was his political heir who he groomed. The coterie planted MGR's wife Janaki Ramachandran as chief minister and publicly humiliated Jayalalitha. That public humiliation perhaps made her more aggressive and revengeful. While I do not subscribe to many of the freebies that she gave to people as that was nothing but a growing trend of bribing the voters but in some way good too when politicians are amassing huge wealth, living king size life, palatial bungalows, shamelessly spending money on their personal grooming then, one feel atleast, people are getting something. Its people's money but my one request to freewallahs as well as to the people who feel elated over that is that why don't they ask to give land to the landless and house to homeless in their manifestos. Can any political party do it? It will fulfill the dreams of our constitutional forefathers of housing for all. It will relieve people and make their positive energy used elsewhere. Politicians made people virtually beggars. For media it become an spectacle to suggest how many lakhs converse.. what a great leader one was and how much popular one was... let me say, people in India have enough time for all politicians, film stars, cricketers... and even when crooked dies people will go in millions. It is only when some body really good dies that we dont even remember. How is that a leader die and people become 'helpless'? Leaders are becoming larger than life and people powerless and helpless. This is not a great sign of democracy. Such larger than life images of politicians only hurt democracy. Can we see some day a public figure die and cremated silently. Is there a need for grand function? But then it is the best period to market your religious belief, plant political agendas on non political people who look for a miracle. 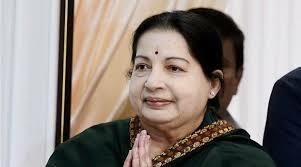 Jayalalitha lived in style and never believed in any niceties and lived life on her conditions. It was she who on a midnight knock got an old Karunanidhi arrested from his house. Many of today's mass leaders rarely came from the mass movement. They don't remain leaders but much bigger like Gods and Goddesses and we start worshipping them. Political people worshipping their leaders only reduce democracy to biggest farce when these power elite use democracy to subvert law and enjoy power without any accountability. There are many 'great' leaders and when they pass away you will see the same kind of rhetorics and dramas as we saw in Chennai. The grand spectacle was in Chennai today, in Mumbai several years back, may be in Lucknow, Patna, Delhi, Hyderabad or elsewhere tomorrow... people have never been a problem in this country.. they come in the largest numbers... the only time they won't when you want to do some really good work. Whatever may be her wrongs, Jayalalitha allowed ensured that in Tamil Nadu the political power remain with the Dravidian parties. With Jayalalitha's passing away the Hindutva groups are now cosying up to her party. We hope the Dravidian legacy will remain strong in Tamil Nadu as any alliance with Hindutva will ultimately finish them politically in the state. Regional parties must learn from the experiences that BJP always started with a junior partner in many states but become senior partner after several years through various mechanism of using contradictions. This is a crucial phase of Tamilnadu and we hope both DMK and ADMK retain their respective identities, but there is every danger at the moment where powerful drawing room mechanism might play games and push ADMK to the lap of Hindutva forces which would be the most dangerous thing. Jayalalitha did not do despite her soft corner for brahmanical rituals and practices. Tamil Nadu's political formulations now need careful observation and we hope politicians will show maturity to their ideologies and provide a pro people inclusive governance.